Install the Metal Kettle repo today to get some of the best TV Addons such as Football Highlights, MK Sports, and Movie Night! Choose the empty field to enter a name for the new source. We use the letter “m” for Metal Kettle. Choose the file path field and enter http://kodi.metalkettle.co. Choose the repository.metalkettle-1.7.2.zip file and Hit OK to Install Metal Kettle Repository! Once the Metal Kettle repository is installed, go to SYSTEM > SETTINGS > Add-ons -> Get Add-ons. To launch the newly-installed TV addon, go to the Kodi home screen, then VIDEOS, then Add-Ons. Metal Kettle Repo Install is fast & easy! Metal Kettle Repo Not Working? Re-install the Metal Kettle Repo using the steps above. If it still doesn’t work, then re-install Kodi and reinstall Metal Kettle. 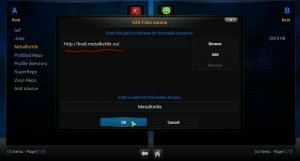 Problems installing the MetalKettle Repository typically are a result of poor network conditions or a corrupt Kodi installation. So re-install each to eliminate the possibility that your Kodi installation or your MetalKettle files are corrupt! The link below will download the MetalKettle Repository directly from the official server.